A section of police officers stationed at the Nevis Division of the Royal St. Christopher and Nevis Police Force listen attentively at the New Year Celebration Service of the Royal St. Christopher and Nevis Police Force at the Charlestown Police Station’s Recreational Room Jan. 3. Premier of Nevis the Honourable Mark Brantley delivers remarks at the New Year Celebration Service of the Royal St. Christopher and Nevis Police Force at the Charlestown Police Station’s Recreational Room Jan. 3. Charlestown, Nevis – Premier of Nevis the Honourable Mark Brantley pledged his and the Nevis Island Administration’s (NIA) “genuine support in word and deed” for officers at the Nevis division of the Royal St. Christopher and Nevis Police Force (RSCNPF) to ensure that Nevis, and by extension St. Kitts and Nevis, remain the safest place to work, live and to do business. Brantley delivered the brief remarks at his first engagement as premier at the annual New Year Celebration Service of the Royal St. Christopher and Nevis Police Force at the Charlestown Police Station’s Recreational Room Jan. 3. “My first outing and engagement as the premier is to pledge my commitment to the police that we will be a genuine partner,” he said. 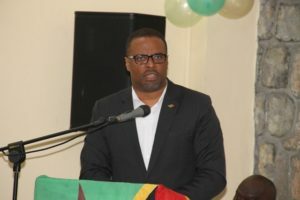 “We will ensure that we make things as comfortable as we can for you but we also ask that you give us the necessary effort that is required to ensure that St. Kitts and Nevis remains one of the safest places to live and work and to do business,” he said. Brantley, who is also responsible for security on Nevis, express appreciation for the officers’ efforts, pointing out that many times they do not get their just due because of harsh public criticism and condemnation when things go wrong. He said in an age of social media – where everyone considers themselves “journalists;” with the conventional media – where the least thing happens, the suggestion is one in which the police are always wrong; and with the public, which very rarely sees the day-in, day-out efforts of the police, Brantley said the NIA would defend the police. “I can tell you as premier, I will come to the defence of the police and the Nevis Island Administration will be there shoulder-to-shoulder with the police,” Brantley said. “I think we recognise and we understand and we accept that our development and the development not only of Nevis, but St. Kitts and Nevis, depends in large measure on the security forces getting it right. If you don’t get it right, it matters little. No other development, frankly, is possible because security is a precondition for meaningful and lasting development,” he said. 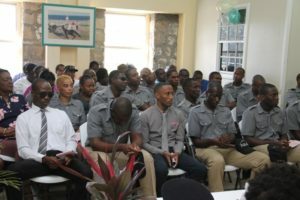 The premier explained that it makes little sense for the NIA to talk about the economy, education and healthcare unless the people feel safe in their homes, businesses, with children on the playgrounds, walking around the communities, going from community to community and being able to work in any community on the island. He said once that can be achieved, it is only then that the full potential of development for the island’s economy will be unleashed. Among those present at the service were the Rev. Erickson Cumberbatch, police chaplain who delivered the invocation; featured speaker Pearlivan Wilkin; Divisional Officer Superintendent Trevor Mills; Commissioner of Police Ian Queeley; and senior officers of the RSCNPF.